Teleseminar & Self-Study Coaching Program: Becoming a Living Magnet - An Introduction to the Law of Attraction from Ready2Go Marketing Solutions, Inc.
To see a sample of the self-study coaching program, click here. Health experts say that you are what you eat, but those who teach and promote the Law of Attraction would say instead: you are what you think. That’s because the Law of Attraction – this mysterious yet simple universal law that continues to gain awareness around the world – addresses a force that affects each of us and that is both subtle in its workings and powerful in its results. Each and every day, it is your thoughts that draw life experiences to you, and in this way, create the reality you experience. It is your thoughts today that will create your future tomorrow. And it is your thoughts, and the emotions they generate within you, that set up the condition for what you will attract to your life, both good and bad. But how many people even realize that in their minds they possess such a powerful tool for creating for themselves a better life for themselves and those of others? If you desire to share with your clients this amazing law that governs the universe we live in, then you will want to further explore this program. Becoming a Living Magnet will fundamentally change your clients' lives and the way it unfolds for them. 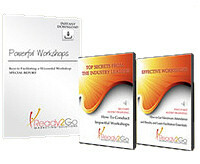 Be introduced to the Law of Attraction and review the six key teachings that are at its core. See the link between two critical elements needed in order to make the Law of Attraction work and work optimally. Review the six things that can sabotage the Law of Attraction process, thus blocking it from working, or at least working better. Discover two Law of Attraction practice techniques that can help you energize what it is you desire and attract it more assuredly into your life. Activity: "The Power of Attraction"
Activity Objective: Participants listen to examples of people who, like magnets, have drawn something they desired into their lives. Activity: "Law of Attraction – Six Key Teachings"
Activity Objective: Participants learn the key teachings of the Law of Attraction and reflect on a time where the Law of Attraction may have been at work in their lives. Activity #1: "Thought and Energy"
Activity Objective: Participants are introduced to the two critical elements that make the Law of Attraction work, and at the same time experience the energy associated with the various thoughts we can have. Activity: "Sabotaging the Law of Attraction Process Mini Lecture"
Activity Objective: Participants learn about what sabotages the Law of Attraction process. They then identify which of the blockages presented is likely to be a challenge for them when using the Law of Attraction. Application – What Do You Desire? Activity: "Identifying What You Desire"
Activity Objective: Participants identify and write out a desire they have and are given two techniques through which to practice attracting this desire.